For a brief account of my chess career, see my Chess Biography, which includes links to a short article about Sittingbourne Chess. Apart from some team victories (notably captaining Oxford University to victory in the National Club Championship, and the Knights of the Square Table to five successive victories in the British Postal Chess Team Championship), my most notable achievements have been as a player of correspondence chess. 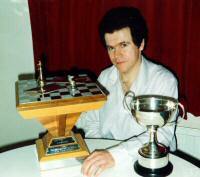 In 1990 I won the British Championship with 8/10, and qualified as a British Master. Then in 1994 I qualified as an International Master, thanks to my performance in Semifinal 1 of the World Correspondence Chess Championship (which I won with 10/12). This also brought me a rating of 2610 (31 in the world), and an invitation to play in the NPSF-50 "super tournament" – the first tournament in history to reach Category 15 strength. I came fifth with 8/14, and so in 1997 qualified as England's tenth International Grandmaster. For details of all these games, see the page on Title tournaments. For my games in various gambit tournaments (1986-89), see Gambit tournaments. I plan to put here a collection of annotated games, starting with those that have been previously published in various magazines etc.